Allegiance Health Center of Ruston, Leslie Lakes Retirement Center and Bienville Medical Center are pleased to host the 5th Annual “SWING for ALZHEIMER’S” Charity Golf Tournament. Proceeds from this tournament go directly to the Alzheimer’s Association. Last year’s tournament raised over $10,000 for the Alzheimer’s Association which brings our total to over $30,000 raised over the past 3 years. Currently, over 5 million Americans are living with Alzheimer’s disease, and millions more are faced with the financial and emotional challenges of caring for a loved one with the disease. The Alzheimer’s Association®, the leading voluntary organization in Alzheimer’s research, care and support, is dedicated to finding prevention methods, treatments and an eventual cure for this debilitating disease. 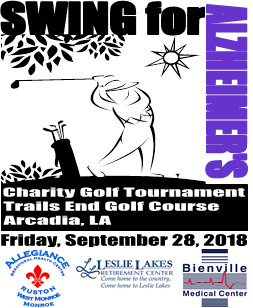 This year’s event will be held on Friday, September 28th, 2018 at Trails End Golf Course in Arcadia, Louisiana. This is a two flight, 18-hole tournament with shotgun starts at 7:30am and 1:15pm. Registration begins at 6:00am with a continental breakfast. Trails End Golf Course is a 18-hole regulation course and offers a great experience for all. A critical component of the success of this event is the contributions received from vendors and sponsors. Let this letter serve as an opportunity for your company to consider contributing financial support to our golf tournament. Sponsorships are tax deductible. For your convenience, we have attached a Sponsorship Opportunity form describing the levels of sponsorship. Other sponsorships such as food, refreshments, door prizes and player appreciation gifts are available as well. Sponsors of these categories will also be recognized for their contribution. The overall success of our tournament is dependent on the golfers and your sponsor contributions. We thank you for your consideration of this request and your support of the “SWING for ALZHEIMER’S” Charity Golf Tournament. Please contact us if you have any questions regarding this event. Click here for sponsorship and tournament registration forms.